I got all my crap cleaned up off the floor last night and organized on my table shelf. Its not perfect yet because I have not made my big trip to The Container Store yet, BUT its a step in the right direction. I don't have all the matching boxes yet...but I hope to get there soon. Till then I'm happy with the crap off the floor and the little labels on each box. It's the small things that make me happy. Looks good, even if the boxes don't match. I love the labels on each box. Hooray for labels! Everything looks more official with them. :) can't wait to see more of the table - what a great gift! holy! 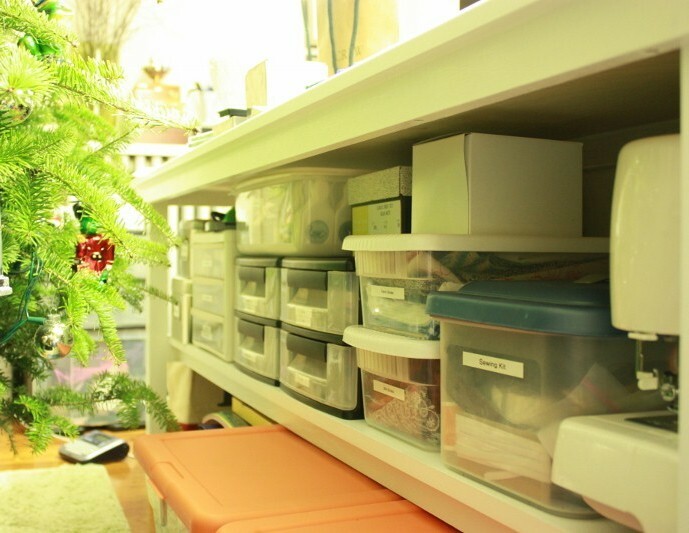 what a difference some organizing, clear bins and labels can make - it looks great so far! I had to laugh... my "sewing kit" is in the exact same container with the same label. Too funny. It's amazing how great it feels when everything has a place, and you can see it! looks great. I am an organizing freak. I really need to tackle my garage, again, this year. I LOVE your new table! You must be so excited. Love the organizing! oooh it look so pretty! You are definitely well on your way! Love the labels. They help a ton. I see your little label maker in the floor. I love mine! Can you come over to my house pleasssssssssse? I'm with you on the small things. They make a big difference. You are inspiring me to tackle my office! Mailing your package today-- sorry it's so late!